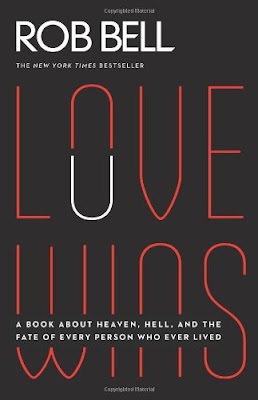 Home / all / Voices / "Love Wins"
A Review of Rob Bell's Book, "Love Wins"
This is a book review about “Love Wins,” by Rob Bell, in the context of my life, because it deals with subjects that have real implications on real people’s lives. First, the context: why I read this book. St. Olaf forced me to question the Bible and my beliefs. An activity that I had been told so many times would cause me to lose my faith and go to hell. It was a frightening and prayerful process. St. Olaf’s version of Christianity acknowledges the many voices in the Bible as people grappling with God, and acknowledges that we are all people who can only know in part, and who must depend on the grace of God for the rest. There are still traces of my Southern Baptist education left with me. I still like to sit up front in church and can’t help moving to the music, and I’m not afraid to tell people that I am a Christian. Other things, I’ve buried, but they’re still there. Fear of hell being a big one. In response to that fear, I developed a keen sensitivity to any suggestion of exclusivism or any suggestion that one has to or should think anything, and I run from it. I also don’t think or talk about heaven and hell. This, I think, is something that I share in common with many people in my generation, who have also been stung by those who would tell them they belong in hell. Pastor Rob and Lutheran Campus Ministries provided a safe space for me when I was still fresh from St. Olaf, and continues to offer a safe space under Pastor Sarah for a new group of students. At LCM, I knew that no one was harboring exclusivism in their hearts. We didn’t talk about who went to heaven or hell, or if there was something we were supposed to believe or not. We talked about social justice and the impact of sharing a meal together, and we worshipped. Gloria Dei’s members and especially the church leadership, including church staff, council, committee heads, and leaders without official titles, have been welcoming to my family, and I feel more bonded to people in this church than I ever have at any church before. But, the truth for Owen, Estes, and I is that we only have this school year left, and then we have to look for a new church4 , and we’re not going to find another Gloria Dei. These years have 4 strengthened us and convicted us that church is an important part of our lives. And with that conviction, we have to face the fact that we may not find another place that makes us so immediately comfortable. I’m realizing that it’s time for me to start thinking about heaven and hell again. I don’t want to give up being part of a church because I can’t find a pastor who never says the word “hell.” Having shared some of these feelings with Pastor Roger, he suggested the book, “Love Wins,” by Rob Bell. While it’s tempting for me to summarize Rob Bell’s ideas, because I enjoy engaging in them, I would be failing if you read this review and thought “I don’t need to read it, because Summer already told me all the best parts.” So, my hope is that this book review will entice you to read it, react to it, and tell me your thoughts. This book will appeal to those who dislike church for its exclusivity and obsession of heaven and hell, but still feel a draw to the church and a desire to engage with a version of Christianity that’s focused on God’s grace and Jesus’ teachings on social justice, life, and love. God offers us everlasting life by grace, freely, through no merit on our part. Then God will torture you forever. My favorite parts, it turns out, are those about judgment and hell. Like me, Bell has been condemned to hell by other Christians, for believing in the wrong things. Nonetheless, Bell actually convinces me that God’s judgement is a good thing­­--something that frees humanity of injustice. He speaks of God’s anger toward exploitation, abuse, and mistreatment. The biggest turn­off for me is the delivery of ideas as the truth. As Bell says “This isn’t just a book of questions. It’s a book of responses to these questions.” Perhaps I interpret too much from this phrase, but it suggests to me that Bell is presenting the book as a book of answers. The answers. Having read and heard so many versions of the truth, I can’t trust any one person’s interpretation of it. Nonetheless, as far as truths are concerned, I see more of God in Bell’s version that I do in many others, and ultimately I’m comfortable shaking off this concern as a stylistic choice and not something that needs to undermine his message. Bell also acknowledges that the ideas presented were not first crafted by himself, but have been part of the conversation of Christianity from the very start. Overall I was especially impressed by Bell’s ability to present deeply theological concepts in a way that was humorous and accessible, making it a fast read that leaves the reader with many hours of fodder for thought and discussion. Thank you to Pastor Roger for the suggestion, and I hope that more Gloria Dei members will read “Love Wins” and start a conversation with me! Summer, thank you for sharing some of your faith journey and for your thoughtful review of this book. I've been intending to read it for a while now and you have accomplished your goal of spurring me on to do that! I'm reading this book right now we should meet up to discuss the above further. Thank you for sharing.